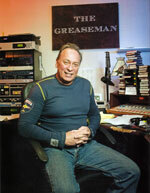 This is simply a place where I'll present miscellaneous articles, news bits, and other stuff relating to the Greaseman. How many of Sgt. Fury's fellow platoon members can you name? How many of Tuckusfacius' characters from the Holy Roman Empire can you name? How many chapters of the Habadogaga Handbook have you heard? 10/8/97 - Greaseman's Book Is Out!!!!!!!! 1/14/98 - Where are my CD's??? 1/20/98 - CD's are on-the-way!!!! 3/18/98 - Greaseman on "Lifetime"!! 4/15/98 - Greaseman coming back to Jacksonville!!! 8/31/98 - Greaseman In The U.K.!! !